Groups are a great aid for organizing your map and for making many mapping tasks easier. Map elements that have been put into a group can be treated as a whole, and thus they can be edited, transformed and modified as if they were a single object. Groups can also hide their elements from the views and lock them in order to prevent them from being edited. In the latest versions of CaWE, groups are also persistent: Groups are saved in and loaded from Cafu map files so that they are available from one session to the next. Moreover, any changes to groups and their properties are recorded in the edit history and can be undone via the Edit → Undo menu. In summary, groups act like layers in image processing programs. They are helpful and easy to use. This section explains the details. Use the Tools → Group (Ctrl+G) menu. 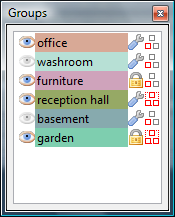 Click one of the buttons Group, Hide, or Hide Other in the Selection tool toolbar. Each of these menu items or buttons creates a new group and puts the selected map elements into it. The Hide Other button is an exception, as it will group everything else. The two Hide buttons additionally mark the newly created group as hidden, so that the selected map objects will disappear from the views. The Groups panel shows a list of all groups in the map. If the Groups panel is currently not visible, use the View → Panels → Groups menu to show it, or see Panels for more information. Each group is shown in a line with information about the groups settings: its visible/hidden status, its name, its color, its edit/locked status, and whether the group members are selected individually or as a whole. Each of the icons can be clicked in order to toggle its status. This is very useful for getting things “out of the way” when you're editing a portion of the map that is usually occluded by other map objects. It's also a nice trick to enhance the performance on older computer systems: When the rendering is too slow, just hide the parts of the map that you're currently not editing, and the rendering of the remaining objects of interest will be much smoother. The initial name of a group is automatically assigned when the group is first created, and can be changed at any time: Press F2, single-click a selected group, or use the context menu (described below) in order to assign a new name, e.g. one that describes the content or purpose of the group. When you double-click the group name, the members of the group are selected in the map. The groups color is indicated by the background color of the group name. When activated in the CaWE Options dialog, the member elements of a group are rendered in the groups color, so that they are easy to see in the map views. the members of the group can be selected. This icon toggles whether groups can be selected with the Selection tool. When the icon shows the lock, the members of the groups cannot be selected in the 2D or 3D views, and thus they cannot become the subject of inadvertent edits, transformations, or other modifications. the members of the group are selected individually. the members of the group are selected as a whole. This icon toggles the actual grouping behavior of the group. Usually, you will want to have this set to “select as a whole”, so that a mouse click on a part of a group selects the whole group. However, it can be preferable to have this set to “select individually”, for example when the primary purpose of the group is to temporarily hide or lock its elements. Select Selects all members of the group in the map, just as if they had been selected with the Selection tool. This is the same as a double-click on the group name. 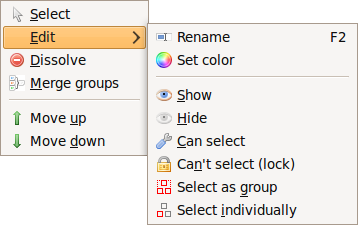 Edit Using the submenu, you can change the properties of one or more groups that are selected in the Groups panel. Dissolve This menu item ungroups the members of the group and then deletes the group. Note that it does not delete the map elements itself, they're just ungrouped. Merge groups When two or more groups are selected, their members can be merged into a single group. Move up/down Use these menu items to change the order of the groups in the list. It is important to note that multiple groups can be edited via the context menu: Just select one or more groups, and the context menu operation will affect them all at once. Any changes to groups and their properties are recorded in the edit history and can be undone via the Edit → Undo menu.